Cork City moved to within a point of Dundalk at the top of the Premier Division as they recorded their biggest league win of the season. First-half goals from Garry Buckley and Jimmy Keohane put the Rebel Army firmly in control at half-time. From the off, they were lively, with Keohane, Karl Sheppard and Barry McNamee moving the ball well. Sheppard tested Ger Doherty with a long-range shot before Derry's Dan Seaborne needed to get a vital touch to stop McNamee turning in a Sheppard cross. However, Derry should have gone ahead on 18 minutes only for Ronan Hale to blaze over from Jamie McDonagh's cross. With the next play, McNamee and Sheppard put in Buckley, who provided a great finish. The second goal came when Graham Cummins held the ball up before laying off to Keohane who fired home from 20 yards. Cummins was central to the third goal when it did arrive five minutes into the second half, as he unselfishly squared for Buckley to tap in for his second. It was soon 4-0 as Damien Delaney headed in when Sheppard kept McNamee's corner alive. Derry's only real chance of the second half was a long-range effort by Aaron Splaine which was well wide and Cork made it five late on, sub Ronan Coughlan marking his first league appearance for the club with a chip over Doherty after the keeper saved from Steven Beattie. A win on Friday away to Bray Wanderers will put Cork back on top of the table, albeit with two more games played than Dundalk. 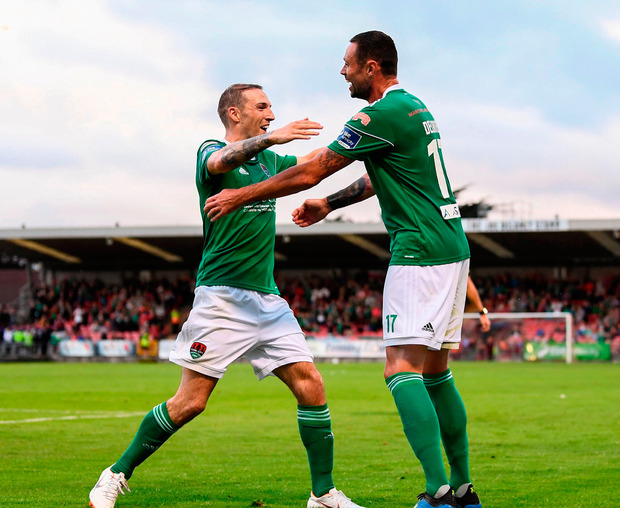 CORK CITY – Cherrie; Beattie, Delaney, McLoughlin (Barry 69), Griffin; McCormack, Keohane; McNamee, Buckley, Sheppard (Sadlier 76); Cummins (Coughlan 66). DERRY CITY – Doherty; Cole, Peers (Toal 55), Seaborne; McDonagh (McDermott 55), Shiels, Splaine, McEneff, Fisk (Delap 66); Roy, Hale. REF – R Hennessy (Clare).